Geelong is a very liveable city with a relaxed lifestyle. It is close to beaches and the countryside yet Melbourne is only an hour away. Geelong has affordable housing, is not as congested as other cities and has great healthcare and recreational facilities. 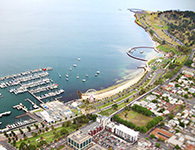 Read on to discover practical information to help you get started living in Geelong. There is a diverse banking industry in Australia regulated by the Government. Read on to find out practical and important information such as how to open a bank account. Our weather has something for everyone and would be described as a temperate climate, with cool wet winters and warm dry summers. In winter the mean day temperature is 10 °C in winter but be prepared for cold mornings over the winter months with 6 °C and short days. It rarely gets to freezing. In the summer the days are longer with the mean day temperature 21 °C in January, though you can expect a number of days when temperatures go over 40 °C. Geelong has a lower cost of living compared to other cities like Melbourne or Sydney. There are a wide range of stores where you can buy food. Cooking at home is the best option for tight budgets. However, you might like to eat out sometimes and Geelong has a place for every pocket and taste. Geelong has a public transport network consisting of trains and buses. If you want to use public transport, you will need to buy a Myki card. Cycling is an option for those ones who want to save some money and keep themselves fit at the same time, as Geelong has many bike lanes in the city, but you need to be aware of the road rules for bicycles. On the other hand, if you can afford a car you should be aware of the annual running costs and road rules. On some occasions you may want to take a taxi or ride share. Geelong is a family friendly city, where all of you can enjoy a great scope of activities for the littlest of the house to adults as well. Stay tuned to the Events Geelong website to read about what’s on. To bring your family over to Australia while you study here, you must list your family members (husband/wife and children) on your application. For more information go the Department of Immigration and Border Protection website.